While I do love the look of some well fitting bottoms and a casual-cool top, how many pairs of well fitting pants do you own? They're like the mythical unicorn of the fashion world. Well, eShakti is here to fix that! 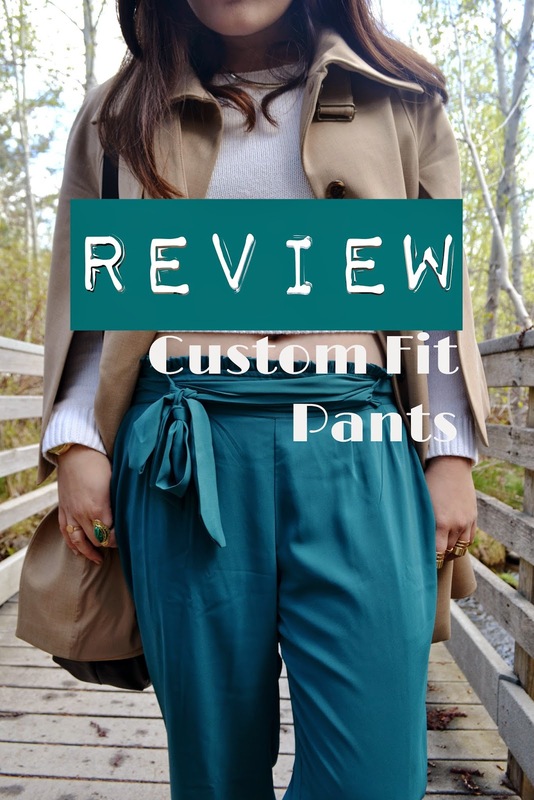 You may know them for their popular custom fit dresses (which I've featured here, here, and here), but they've recently expanded that to include custom fit pants too! 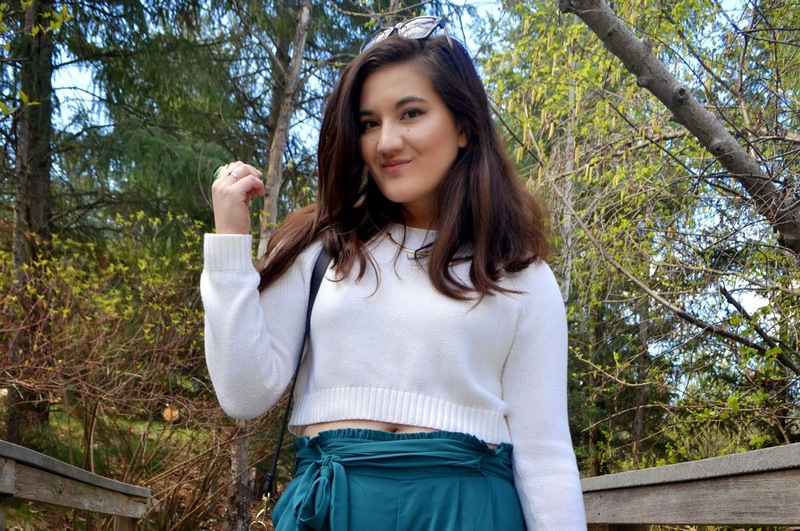 I had the opportunity to take a pair for a test drive, and I chose these loose, teal cropped bottoms, an unusual trend that I normally wouldn't try. However, I was feeling adventurous, and the rich hue lured me in. My conclusion? I need more of these pants in my life. Just like all their dresses and skirts, these pants also have functioning pockets. Oh my goodness, I'm in love. They're on trend, comfortable, and fit perfectly. I simply filled out the measurements asked by eShakti, for which they provide useful illustrations and diagrams to make sure you're measuring the correct way. It's like having a personal tailor online! These pants don't cinch me in awkward places like most bottoms do and create a muffin top. In fact, I was so confident in them I slipped into one of my cropped tops. Combined with a snug sweater and a pair of my favorite heels from Just Fab, I'm really happy with how this outfit and the photos turned out! Also, can you believe I thrifted this cape coat? I'm totally late to that trend, but I don't mind, because I snagged this beauty for $7.50 at the local Goodwill. Besides, it's perfect for tossing on while the weather transitions from winter to spring. Now that's what I call fashionably late! Would you try eShakti's custom fit pants? What do you think about these cropped, loose pants? My favorite look! Loving the accessories too. I don't own a cape but need one as it brings any outfit together. I'm in love with that jacket! Can't believe you got it so cheap!! Those pants look so comfy but totally out of my comfort zone. Maybe I'll be adventurous and try some! Those pants totally ROCK! They look so good on you Linda and you styled it to perfection! Love your accessories. ALso, daaaamn girl, you look dashing in those pants, sooo elegant and exquisite! Sorry I was afk for so long, I missed your bloggy! Nice pants! I really like the way you styled them! What a truly fantastic outfit! This cape is the best find and those pants look so cool and comfy! PS Yay, thanks for entering my giveaway. Fingers crossed!! I love those pants! Great style! Whhhaat I didn't know eShakti did custom fit pants now! They look amazing on you! Also, I love your cape, what a bargain! EVERYTHING is always better with pockets, na'mean? You're killing it in these teal pants though and they definitely have a good fit. I need more custom fit clothing in my life (if only I could afford a personal tailor, ha). You're killin it, girl! Those pants are a gorgeous color and I love the sash. This outfit is so on point--what an incredible deal for that cape coat and what fierce shoes. 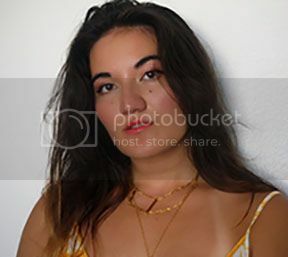 That gold bar necklace is also so versatile and classy. I completely agree with you about the pants--I rarely wear em because most of them are too long, too short, too baggy in the ankles...you name it haha. Super pumped that eShakti has custom fit ones now! It's crazy that the Spring semester is almost over, isn't it? I hope you've smoothly transitioned to your new school--it certainly sounds like you're enjoying it! It's definitely hard to move from place to place, but I've found that I become more grateful of each environment once I leave and return. Wishing you the best of weekends! I've never thought about custom fit trousers before- why doesn't every shop offer this service. I swear a proper fitting pair of trousers is the hardest thing in the world to find. WHAT. 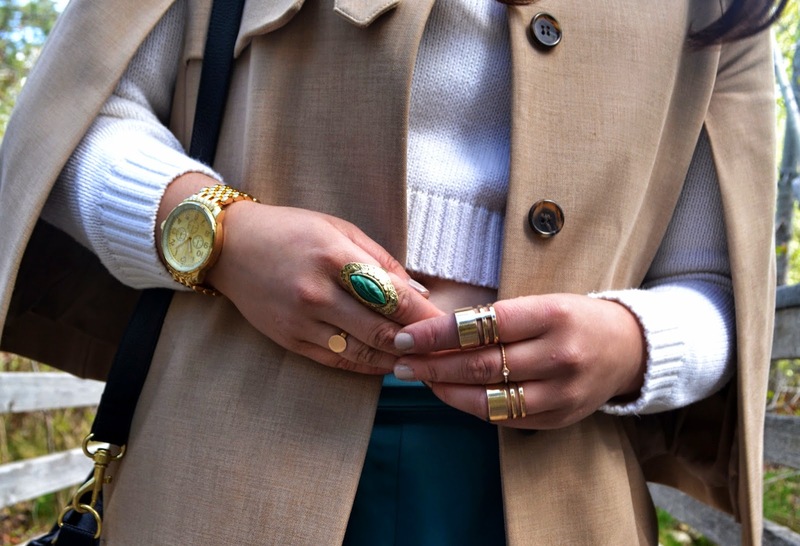 So jealous of your cape coat find- that one's a stunner. And words can't describe how much I love this outfit. I remember getting giddy over it when I saw it on Instagram. That blue color is a dream and I love how sophisticated you look with the lines of it. Gorgeous!! Can't believe you thrifted that cape coat! It's beautiful :) and those custom fit pants look wonderful on you! Love that color. Those pants are on point! eShakti is amazing yet again! Plus that color is so you! Look fabulous, Miss Linda!